Home purchase rates among African-American consumers have slowly crept upward over the past year, reflecting a 2004 peak in homeownership rates, which declined after the 2008 Great Recession. Since the start of 2017, the number of African-American homebuyers has steadily increased by the quarter. Our latest total market consumer sentiment report shows this trend continuing in 2018. As more African-Americans become homeowners, brands and companies will look to further connect with this demographic, as they pursue the American dream. But how can these businesses most effectively connect with African-American homebuyers? 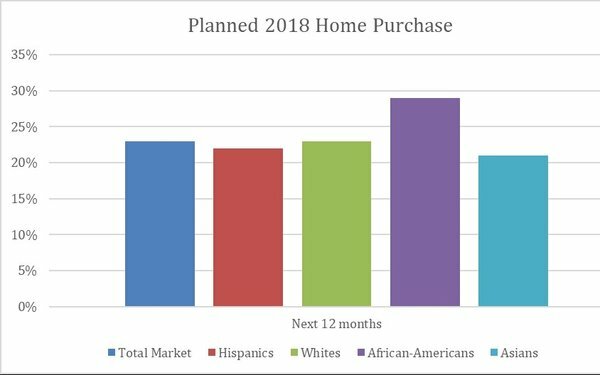 Looking at what makes the African-American homebuyer unique gives brands and companies opportunities to connect authentically with African-American consumers. When looking to market to the Black community, there is possibly no value more important than honesty. The realtor must also become a counselor of sorts, and get to the bottom of the motive behind the desire to own a home. Your strategy will be more about your potential client than yourself, which may mean that you’ll have to put a sale off for a little while. However, your patience will pay, as you’ll gain loyal clients in return. Here are three tips on how to connect with African-American homebuyers in 2018. Quite often, the number one hurdle that stands in the way of home ownership among black populations is less than stellar credit. Take the time to help them sift through their readiness for homeownership, no matter what the pre-qualification says. Encourage potential homeowners to not buy a house, until they have eliminated credit card debt. In fact, they should try to alleviate all other debt before purchasing a home. If worse comes to worst, and they have to decide between paying a mortgage or paying the credit card bill, all it takes is one bad month to destroy their credit for months or years. Make sure they know that buying a home, solely for the sake of no longer have to pay rent, is not a good enough reason to purchase. Give them full disclosure on loan types and the ins-and-outs of home ownership. Put forth the effort to offer free educational opportunities about loan types, benefits of choosing a loan in which you pay a down payment instead of one that offers zero down payment, and the benefits of waiting to buy a home at all. While we can’t predict what might happen in life, we can put ourselves in positions to win if worst-case scenarios present themselves, which they often do. If they know they’ll stay put for a while, or if they know their property would make a good rental in the event they have to leave, they might then consider buying a home. Make sure they know that houses may not be immediate investments, so if they have to sell quickly, it might mean losing money to sell the home. Additionally, find out what numbers make them feel secure. How much do they feel good about having in savings? How much do they think standard repairs cost, because they are definitely coming. How much do they plan to spend on furniture? There’s a lot more to moving in than getting that key and taking a selfie. Make sure there are few to no surprises for your clients. Classes are an efficient way to go about offering this information, so potential homeowners feel stable in their choices. Financial stability isn’t all that’s important; everybody wants a place where they feel safe. Oftentimes, minority neighborhoods gain a reputation of being dangerous, whether they are or not. With minority-heavy neighborhoods come profiling and other challenges. On the flipside, Black people who are the clear minority in other neighborhoods may not always feel safe among their neighbors. It’s important for you to do the work and get the lay of the land of the people who live in a neighborhood, so that your clients know if you’re showing them a house, you’re showing them an all-around safe place. They want to feel like part of the thread of the community; they don’t just want to be tolerated. As you make efforts to reach out to African-American homebuyers, always remember that nothing is as effective as listening. Each case is different, and each person has his or her own needs. Approach them as individuals within the demographic, ask the right questions so you understand who they are and what they need, and proceed accordingly.